This can be found in Settings › Job Types under the Lists section of the screen. 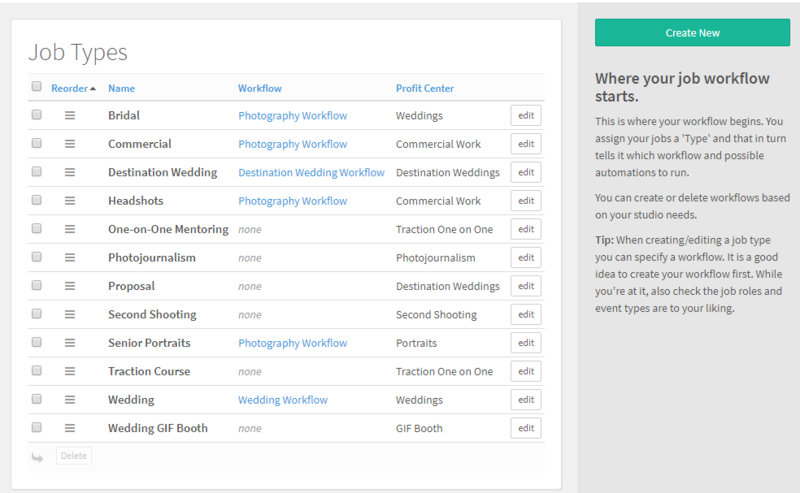 When beginning your Táve account setup, your job types list will be pre-populated with a lot of common job types spanning across all areas of photography. You can delete those that don’t fit your practice and create new ones to meet your needs. In your list of job types you will also be able to see at a glance the workflow you assigned to automatically populate the job’s task list when a job of that type is booked. Within each of your job types you can assign the appropriate workflow of tasks you want to auto-assign those incoming jobs, along with the profit center you want jobs of this type to belong to. Before going into setting up your job type default contacts and events, you have the option of requiring a primary session. For more session-based job types, this will likely be checked. One example of a job type that may not require a primary session is a job booked for the sale of a gift certificate or other booking that won’t include any sessions on its schedule. For each job type you create in your account, you’ll see options to check off the job roles (determined by your job role settings) for those who will commonly appear on the contact list for a typical job of that type. 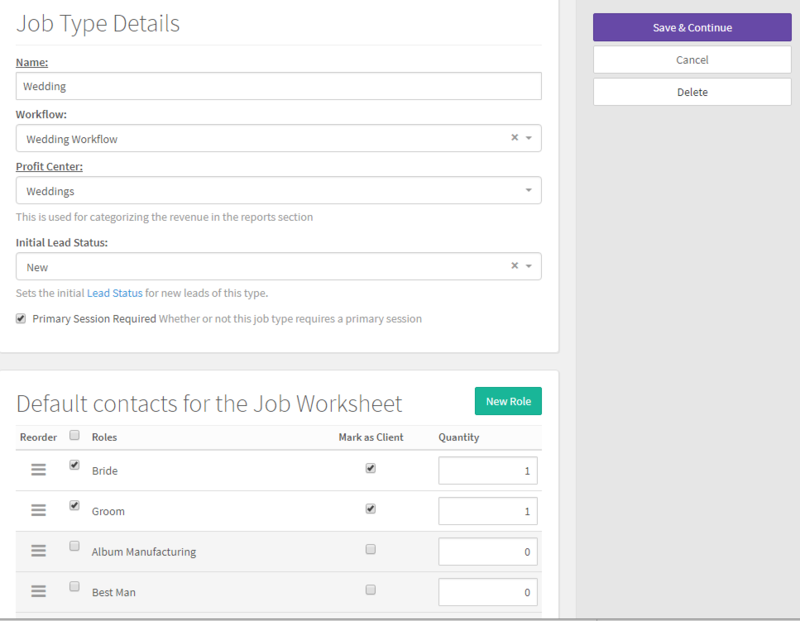 This will automatically create placeholders for you to enter the contact’s details for each of these roles when viewing the job worksheet, saving you some time. You can apply a custom sort for your job roles on each of your job types and the contacts will show in that hierarchy on your job worksheets. You can mark the job roles who are the clients on the job type here as well. For example, for a typical wedding job type, your clients will be those contacts given the bride and groom titles. Other common contacts you may choose to include as defaults on a wedding job can include bridesmaids, groomsmen, and vendors like venue, florist, DJ, etc. Choosing your default events for a job type is very similar to default contacts. You’ll see all of your event types available here, where you can check off the ones that are typically scheduled in a job of this type, sorting them how you'd like them to display on your job worksheets. Using a wedding as an example again, this may typically include a booking consultation, ceremony, reception and maybe even an ordering appointment if you practice in-person sales. If your job type requires a primary session, you’ll want to select which of these event types should be designated the primary session by default. You can also choose which custom fields show on the job worksheet for each of your job types, and reorder them however you'd like! By default, when you create a new job type in Settings › Job Types, all currently existing custom fields will be on the new job type by default and then you can adjust as needed there in the job type editor. 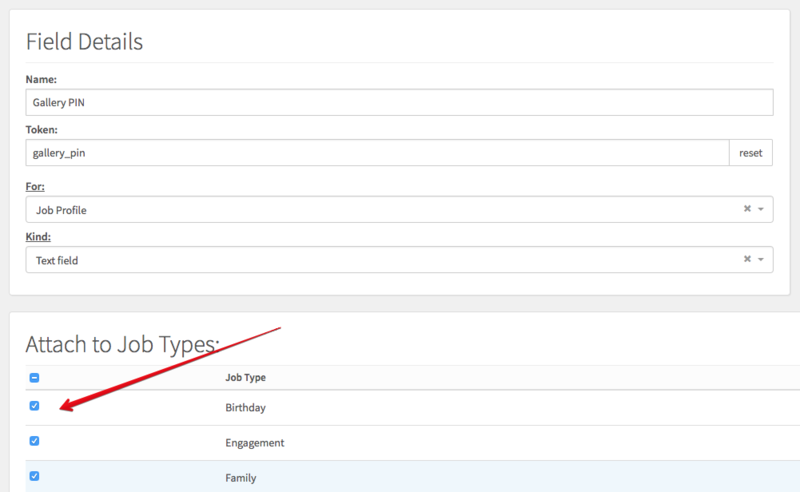 When adding a new custom field at Settings › Custom Fields, you can also quickly specify which job types it gets attached to by choosing them in the Attach to Job Types section shown below. You can attach to all or detach from all there as well. All of the items on the Job Type Editor (Job Roles, Event Types, and Custom Fields) as well as all of your Job Types can be reorganized by dragging and dropping them to override the alphabetical sorting to something you prefer.